HANFORD – Community members and their children, along with hospital and city leaders, were the first to break ground to begin construction on the new $40 million Adventist Health / Family Birth Center at a Groundbreaking Ceremony on Oct. 10. The 49,000-square-foot center, which will provide obstetrics and delivery services for Kings County families, will be built adjacent to Adventist Medical Center – Hanford. It will replace the current birth center at Central Valley General Hospital on Douty Street in Hanford, where about six babies are born every day, or 2,000 a year. Construction is expected to be completed in 2015. Mike McDonough, Executive Vice President of Layton Construction, said the Family Birth Center project is expected to generate 600 to 700 construction jobs over the next 18 months. 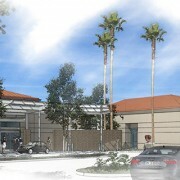 The new center is also expected to help attract obstetrical and gynecological physicians to the region, added Dr. Richard Ellsworth, Hanford obstetrician and gynecologist and chief of staff for Adventist Health / Central Valley Network.